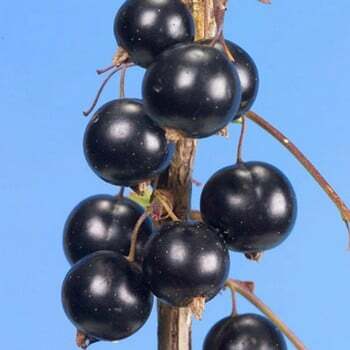 Blackcurrant Big Ben is an outstanding early blackcurrant variety that produces shiny black fruits that are over double the size of standard blackcurrants, but with a much sweeter flavour that makes them suitable for picking and eating fresh, straight from the bush. ‘Big Ben’ crops extremely heavily from late June/July and was bred at the Scottish Crop Research Institute (SCRI). It shows good resistance to both mildew and leaf spot and has recently been awarded the coveted ‘Award of Garden Merit’ by the Royal Horticultural Society.